May 30, 2012 - WESTBURY, N.Y. - VasoMedical, Inc. (“VasoMedical”) (OTC: VASO.PK), a leader in the manufacture and sale of devices for the non-invasive treatment and management of cardiovascular diseases and a leader in the sale of diagnostic imaging products, announced today that it had successfully initiated its international sales expansion plan in Latin America with its participation in Hospitalar 2012 in Sao Paulo, Brazil. 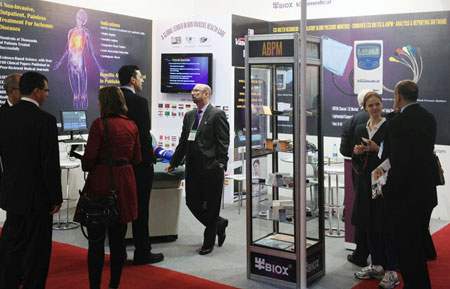 Hospitalar, the largest healthcare exposition in the Americas is an international fair of products, equipment, services and technology for hospitals, laboratories, pharmacies, healthcare clinics and medical offices. 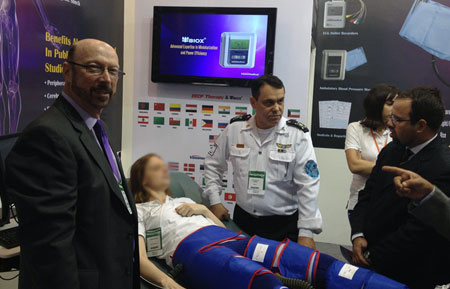 During the 19th edition of Hospitalar, which was held from May 22-25, 2012, over 100,000 attendees visited the 1,400 booths and conducted business meetings. 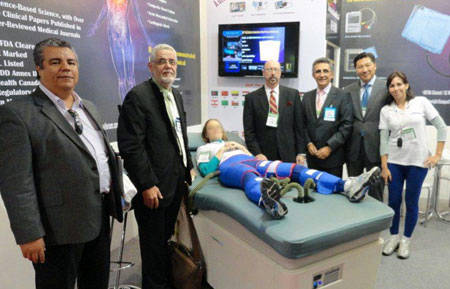 VasoMedical exhibited its LumenairTM EECP® Therapy system, with live demonstrations in the booth. Also displayed were VasoMedical’s other product lines, the BIOXTM ECG Holter and Ambulatory Blood Presure Monitoring products and it's EZTM Patient Management products such as its oximeters and ECG monitor. There was excellent attendance at the booth and VasoMedical personnel had an opportunity over the four days of the show to meet with many customers, government officials, physicians and other healthcare professionals, distributors, and consultants. Brazil has the world's sixth largest population of approximately 200,000,000 people, and is one of the fastest growing medical marketplaces in the world. With over 24 million people older than 60 years of age, it is anticipated that its total healthcare expenditure will reach almost USD 200 billion over the next 5 years. Also, as the elected host of the World Cup in 2014 and the Olympic Games in 2016, Brazil is likely to invest massively in its healthcare market as it becomes a showcase to the world. VasoMedical, Inc. is a diversified medical technology company specializing in the manufacture and sale of medical devices and in the domestic sale of diagnostic imaging products. The Company operates through three wholly-owned subsidiaries. VasoMedical Solutions manages and coordinates the design, manufacture and sales of EECP® therapy systems, its core product, as well as other medical equipment operations; VasoMedical Global operates the Company’s China-based subsidiaries; and Vaso Diagnostics, d/b/a VasoHealthcare, is the operating subsidiary for the sales representation of GE Healthcare diagnostic imaging products. Additional information is available on the Company's website at www.vasomedical.com. Except for historical information contained in this release, the matters discussed are forward-looking statements that involve risks and uncertainties. When used in this release, words such as “anticipates”, “believes”, “could”, “estimates”, “expects”, “may”, “plans”, “potential” and “intends” and similar expressions, as they relate to the Company or its management, identify forward-looking statements. Such forward-looking statements are based on the beliefs of the Company’s management, as well as assumptions made by and information currently available to the Company’s management. Among the factors that could cause actual results to differ materially are the following: the effect of business and economic conditions; the effect of the dramatic changes taking place in the healthcare environment; the impact of competitive procedures and products and their pricing; medical insurance reimbursement policies; unexpected manufacturing or supplier problems; unforeseen difficulties and delays in the conduct of clinical trials and other product development programs; the actions of regulatory authorities and third-party payers in the United States and overseas; uncertainties about the acceptance of a novel therapeutic modality by the medical community; continuation of the GEHC agreement; and the risk factors reported from time to time in the Company’s SEC reports. The Company undertakes no obligation to update forward-looking statements as a result of future events or developments.